About 4 million unauthorized immigrants are eligible for temporary deportation relief under President Obama’s new executive action, but how many will take advantage of the offer? A previous program may offer some insights. One way immigrants may qualify for relief is under the Deferred Action for Childhood Arrivals program, which started in 2012 and is now expanding. In that program, applications surged after the program’s launch and trailed off over time. Today, nearly two-thirds (64%) of the estimated 1.1 million unauthorized immigrants who are eligible have had their applications accepted for review. DACA offers deportation relief and work authorization to those who came to the U.S. as children. So far, about 702,000 unauthorized immigrants have had their applications accepted for review since the program began in August 2012, according to recently released U.S. Citizenship and Immigration Services data showing program applications, approvals and renewals through Sept. 30, 2014. Of the applicants, 87% have been approved for the renewable two-year permits. With the first wave of permits beginning to expire, the government is starting to receive renewal applications. So far, more than 22,000 of the initial DACA recipients have had their applications for renewal approved. President Obama’s new executive action expands DACA to an additional 330,000 unauthorized immigrants, by making eligible those older than 30 who arrived in the U.S. as children before Jan. 1, 2010. Previously, the program was restricted to those 30 and under who were brought to the U.S. as children before June 15, 2007. A $465 application fee remains in place. 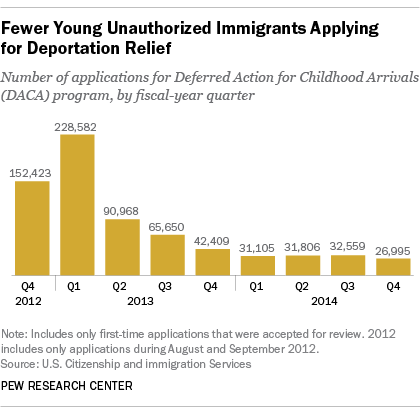 Applications reached a high in the first full quarter DACA was available, then dropped off steeply. The number of applications peaked from October to December 2012 when more than 228,000 applications were accepted. The following quarter, January to March 2013, the number of applications fell by more than half, to nearly 91,000. In 2014, quarterly applications have not exceeded 33,000. States with the largest number of unauthorized immigrants also have the most people applying for DACA. Two states, California and Texas, have more than one-third, or 4.1 million, of the nation’s unauthorized immigrants. For the DACA program, California and Texas account for 45% of all initial applications, with 199,781 and 115,614 applications, respectively. While the president’s programs have extended deportation relief to millions more unauthorized immigrants, including more immigrants who were brought illegally to the U.S. as children, the president’s new programs do not extend deportation relief to 210,000 parents of DACA recipients who do not have U.S.-born children.